Extra trains now run on the Exmouth branch to Exeter Central. Great Western Railway has doubled the frequency on the branch, which had been hourly but is now half-hourly. Also, more services have been extended to Exeter St Davids. 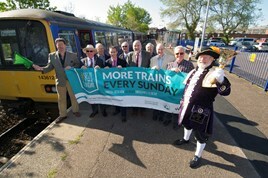 GWR is working with the Avocet Line Rail Users’ Group and Devon and Cornwall Rail Partnership to encourage locals to use the trains, through a new website (www.SeizeTheSunday.org). This suggests activities such as food, live music and visiting pubs. And to the rescue a pacer unit. Services seem to be extensions of Paignton and Barnstaple - Exeter services.